The kahawai is widespread throughout New Zealand and will be found from estuaries to the outer islands. This sleek fish has an average size between 40-50cm long, and an average wiehgt of 1 to 2kg. Appropriate tackle is 6-10kg mono or braid is even better as the bites are small. As their tremendous fighting ability has earned them a reputation as a top light tackle game fish, especially on salt-water fly (SWF). They can be found year round and will be enticed by plenty of berley. 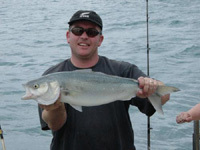 Kahawai are most often caught on a jig, softbait or trolled lure or fly when they are schooling. A cast spinner will also work well in the same situation. Match the hatch. If they are feeding on small silver baitfish, a silver jig will be deadly for example. 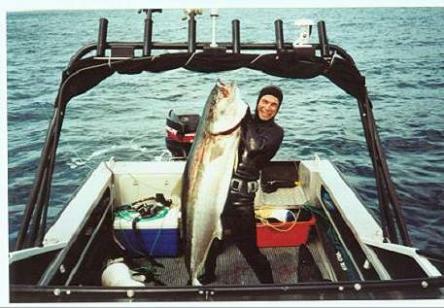 Kahawai can be caught in most of our inshore waters. They are often found in schools on or near the surface and generally where you see birds diving and feeding, the kahawai will not be far away. Morning & evening seem best but kahawai can be caught year round and at any time during the day.Soft baits, jigs, flies, spinners and flasher rigs are all very effective. They'll eat any of our normal cut baits such as pilchards, squid skipjack etc.